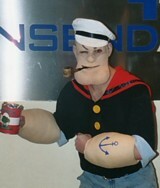 Articles & Stuff - Other Stories - Popeye Prosthetics - Why Am I Not Rich? Another idea that almost came to fruition but didn't is a foam rubber chin. Popeye's chin to be exact. 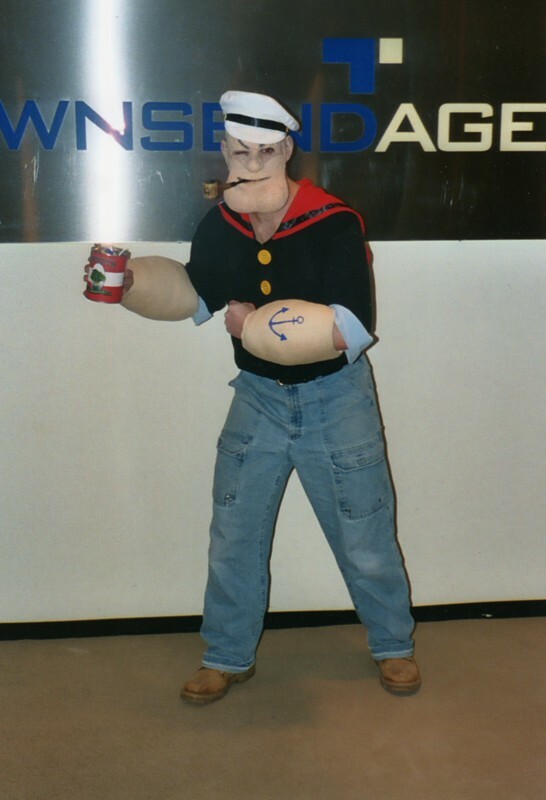 Several years ago I created this costume by casting my head and sculpting the enormous chin, nose and brow. By using a rigid but highly aerated latex compound I was able to keep the chin light and pliable so that it would move with my own lips and jaw, but could also be held on with only a little spirit gum and not be uncomfortable. Needless to say, King Features (the owners of the Popeye character) also thought this was cool and gave me the go ahead to get it manufactured. Hong Kong was on board, right down to the prototyping stage. What sank the ship? American distributors wouldn't pre-order without seeing the finished and packaged product, and the manufacturers couldn't afford to tool the factory for small orders. Try to convince investors that giant rubber chins is a great idea when you are just an artist, not the head of a giant company. In any case, this is proof of concept and intellectual property, so if you think you can make money off of this you had better include ME! Thank you for your support.